JULY 2018 I FLEX007 MAGAZINE 65 disastrous. Even the electrical properties can be impacted. A third factor is the speed of new product development taking place in the market. The life cycle and product life of almost all devices and new products has condensed dramatically in the last several decades. OEMs expect delivery windows of their vendors to be in alignment with the speed of their own development work, which is faster than ever. This introduces hurdles for off-shore suppliers in becoming the chosen flexible circuit supplier early in the design phases such as responsiveness, time zone differences, communication obstacles, and delivery. Once the flexible circuit engineer- ing and customization has been solved and is successfully tested even within the proto- type phase, OEMs have difficulty rational- izing the potential cost savings of changing to an offshore supplier vs. the economic impact of a significant problem that may be introduced due to the change. As discussed, the flex industry is strong in the U.S., not because of one single factor, but as a result of a combination of items: the flexible circuit addressing key mechani- cal functions, the OEMs' need to utilize the knowledge and expertise of the flex sup- plier to solve the mechanical functions, the potential hidden risk of mechanical issues surfaces when changing vendors, and the speed of OEM product development cycles. 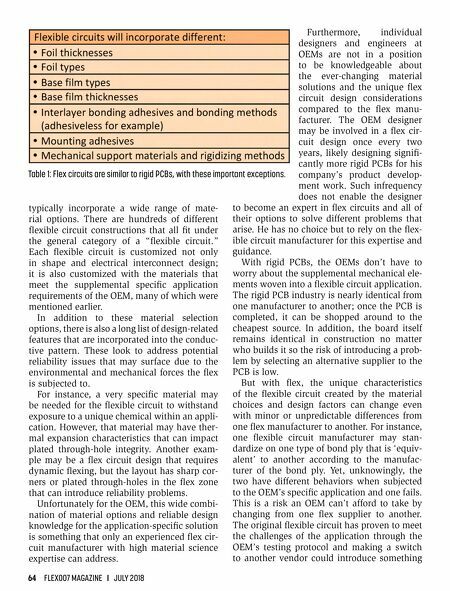 For OEMs, understanding that a flex circuit is more than a PCB is an important ingre- dient in the sourcing equation. 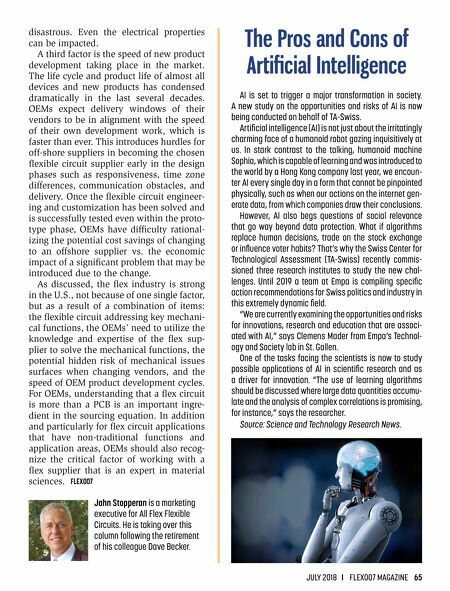 In addition and particularly for flex circuit applications that have non-traditional functions and application areas, OEMs should also recog- nize the critical factor of working with a flex supplier that is an expert in material sciences. FLEX007 Jahn Stopperan is a marketing executive for All Flex Flexible Circuits. He is taking over this column following the retirement of his colleague Dave Becker. The Pros and Cons of Artificial Intelligence AI is set to trigger a major transformation in society. A new study on the opportunities and risks of AI is now being conducted on behalf of TA-Swiss. Artificial intelligence (AI) is not just about the irritatingly charming face of a humanoid robot gazing inquisitively at us. In stark contrast to the talking, humanoid machine Sophia, which is capable of learning and was introduced to the world by a Hong Kong company last year, we encoun- ter AI every single day in a form that cannot be pinpointed physically, such as when our actions on the internet gen- erate data, from which companies draw their conclusions. However, AI also begs questions of social relevance that go way beyond data protection. What if algorithms replace human decisions, trade on the stock exchange or influence voter habits? That's why the Swiss Center for Technological Assessment (TA-Swiss) recently commis- sioned three research institutes to study the new chal- lenges. Until 2019 a team at Empa is compiling specific action recommendations for Swiss politics and industry in this extremely dynamic field. "We are currently examining the opportunities and risks for innovations, research and education that are associ- ated with AI," says Clemens Mader from Empa's Technol- ogy and Society lab in St. Gallen. One of the tasks facing the scientists is now to study possible applications of AI in scientific research and as a driver for innovation. "The use of learning algorithms should be discussed where large data quantities accumu- late and the analysis of complex correlations is promising, for instance," says the researcher. Source: Science and Technology Research News.